Thailand: Successful or Incomplete Democracy? Scholars and journalists like to point to Thailand as the country in Southeast Asia with the longest experience of independent and democratic rule. Yet, Thailand’s political history can be better characterized as shifting between different periods of time when power is concentrated (more or less) in the hands of one of these groups: Bangkok bureaucrats, the military, local officials, and/or the king. Thailand has had the benefit of a long period of nationhood and under the absolute rule of King Chulalongkorn (1868–1910) nationalism was developed based on the importance of the king, Buddhism, and the bureaucracy. These were the three elements that legitimized state power. In 1932/33 a coup was carried out as a reaction to aristocratic privilege. Power shifted toward the military and the bureaucratic elites. Although the coup was carried out in the name of the people, power was still held by a cozy circle of bureaucrats and military leaders. The aim of the coup was to weaken the power of the conservative ministers of the royal government and it was not against the king personally. With time, the king’s official power over the bureaucracy and the military has diminished, but he has remained a powerful personal figure and can command considerable behind-the-scenes influence on important issues. 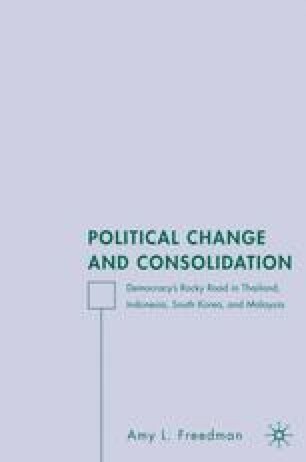 Chapter 1 Thailand: Successful or Incomplete Democracy?